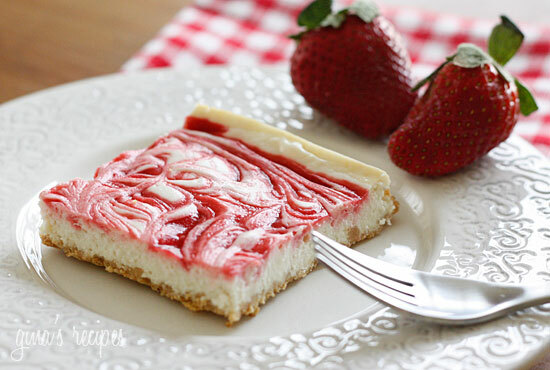 Strawberry Swirl Cheesecake – A low fat cheesecake swirled with strawberry jam on a graham cracker crust. A great low fat dessert for any brunch, dinner party or special occasion like Valentine’s day coming up. I also love Chocolate Raspberry Cheesecake, 5 Ingredient Chocolate Cheesecake Cups, Gluten Free Flourless Cheesecake Brownies and Lemon Cheesecake Yogurt Cups. I was experimenting with cheesecake and fat-free Greek yogurt this week with fabulous results. I personally thought it could have used a touch more sugar, but my husband disagreed so I’ll leave it up to you to decide if you want to add another tablespoon of sugar to your batter. This can be made with your favorite flavored jam, I used sugar free Strawberry but the possibilities are endless. I have a jar of mixed berry jam I can’t wait to use to make another batch. Heat oven to 350°. Coat an 8-inch square baking pan with non-stick spray. Mix together graham cracker crumbs and butter with a fork until evenly moistened. Press evenly into bottom of prepared pan. Gently beat cream cheese, sugar and vanilla until smooth using an electric mixer. Gradually beat in fat free yogurt, egg whites, lemon juice, and flour. Do not over beat. Pour over graham cracker crust. Stir jam until smooth. Drop by small spoonfuls over surface of filling. 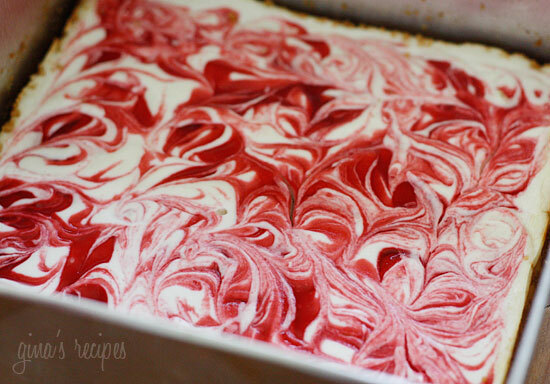 Using a knife, swirl jam gently through filling to create marble effect. Bake 25 to 30 minutes or until center is almost set. Cool to room temperature. Chill a few hours in the refrigerator. Has anyone ever tried this with flavored yogurt, like strawberry for example? I made this with lemon curd, it was really nice! Needed a touch more sugar with the lemon curd as it was quite tart, and a bit more butter to hold the base together, but it made for a delicious easy dessert that took about 10 minutes to throw together and only one bowl to wash up (I did the lot in the food processor). Has a nice texture, too. Will. Sugar replacement t work? Truvia Splenda ?.. Well my first Gina recipe that I didn’t care for. I didn’t like the flavor. I love real cheesecake but thought this was too sour tasting. I also think it’s just too flat, I guess I just like mine w a little more substance. Sure, being it is thicker may require longer bake time so make sure to take out when the center is almost set. Can this cheesecake be made with Splenda or Truvia? Every year when my birthday rolls around, I get this incredible urge for cheesecake. Since I am maintaining weight lost on Weight Watchers, I’ve been checking the freestyle points for cheesecake on some of our favorite restaurants, Most are higher than I hope to use on my whole day. I also want to have a meal. I just remembered your fabulous Strawberry Swirl Cheesecake I used in the past. Have decided to make it today and have it tomorrow on my birthday. No need to fuss on my birthday and only 5 freestyle points. Great! Happy Birthday, hope you enjoy them. Hi Gina, can I just use the egg whites in the box? The recipe for raspberry Chocolate cheesecake looks really good. Could I use full fat yogurt and cream cheese? Would this change the texture of the cheesecake? I know it would increase the calories. Made this for a dinner party and it was delicious!! Used fresh strawberries on top instead of attempting the swirling. So yummy, will be making it again next wk for a small get together! Made this gluten and dairy free using pre made 8" gluten free ginger snap crust, tofu based cream cheese, and plain lactose free yogurt. Fat grams were about double because there aren't fat free versions of dairy free cream cheese and yogurt, but…. OMG! Totally delicious! Recipe amounts fit the 8" crust perfectly and baking for 30 min was just right! Love your recipes and they have all been easily adaptable to our gluten and dairy free diet! Your recipe got my family's approval! Thanks so much! Well, this is in my oven right now for Easter tomorrow. I had to double the crust recipe, because the 1/2 cup didn't even cover the bottom of my glass 8" pan, and my jam kinda sank underneath the surface, so didn't look as pretty and swirly as the picture, but hopefully it will still taste great! Made this for date night a few months ago, amazingly simple and very yummy. Thanks for the recipe! Made this for an extended family dinner tonight. We are trying to eat healthier after my dad's recent heart attack. Everyone loved it and went on and on about how delicious it was. My dad was so grateful for something better for him, thank you! This was delicious! Made it for my husband's birthday tonight. The lemon juice really adds to this. This was amazing. Mine didn't look as pretty, but it tasted great. Didn't taste "skinny" at all. What a great recipe! My wife loves Strawberry Cheesecake, so I made one for her on her birthday. She loved it! Just made this last night…I used blueberry jam and added a bit of lemon zest….so good. Throughout the night my 18 year old son went back for another piece…he loved it!!! I made this today for Valentines Day and my husband had absolutely no idea that it was a skinny version of cheesecake we both loved it! I've made these three times now! I used strawberry preserves the first time, blackberry jam the second time, and I just finished making batch with raspberry jam! These are delicious! Thank you so much for sharing all of your amazing recipes with us! I made this today. Its georgous. Would it still taste as good if I put it in the freezer? I'm afraid I'll eat it all. OH…I didn't mention–I'm GF so I used Kinnikinnik graham cracker style crumbs for the crust and King Arthur's multi-purpose GF flour with perfect results. You can't tell it's GF or lowfat at all! Oh my. These. Were. Sinful. How do you do it?! I made this for Superbowl Sunday and it was sooo tasty. I already ate everything, but I had to eat one of these. My didn't look very pretty. I'll work on that next time. I was really surprised how it taste like full fat cheesecake deliciousness! Are the Weight Watcher points calculated using sugar free jam or regular because I do not like artificial sweeteners so would prefer to use regular jam??? I absolutely love this recipe and it was a huge hit at my Christmas dinner!! I used boysenberry instead of strawberry jam. I'll be making this again soon. Thank you so much for all your wonderful recipes! These tasted so good. My whole house loved them. Even my 3 year old. I made it with low sugar (not sugar free) jam. I am going to attempt to make the entire recipe again (without the jam, graham crackers, and butter) and pour it over low fat betty crocker brownie mix. Do you think I could make this and freeze it? I dont think it would make it in a 3 hour car ride in a cooler unless it was frozen. Thoughts? I made this last weekend and I have never been more satisfied in my life. It's so delicious and you can't even tell that it's low fat. It doesn't miss out on the taste – very fulfilling but I had more than one slice! I actually compared the calories to Cheesecake Factory and I was amazed. If you ate the full 9 servings you'd still be better off than eating ONE SLICE of Cheesecake from the Cheesecake factory! Worth the try! Found this site on pinterest and I am impressed by the beauty of this cake. The swirls look wonderful! I love this site! This cheesecake is amazing. I used blackberry simple fruit to swirl and I used only 1/4 cup sugar. This certainly rivals any full fat cheesecake out there. Thanks Lisa. Amazing! And it was so pretty! Used a 1/3 cup sugar and only 1 T. of lemon juice. Everyone loved it, and no one had any idea it was a lower calorie cheesecake! My sister and I both love your site! Thanks for all your hardwork! I'm thinking about trying this again with chocolate graham crackers and a little bit of melted chocolate instead of strawberry. What do you think? Gina, would i be able to spray Pam with the crackers rather than use butter? or am i totally crazy? Ps. I LOVE THIS SITE. you are truely god sent. Would this turn out good if I used regular vanilla greek yogurt (not fat free, couldn't find it) and fat free cream cheese (instead of low fat)? I am going to give this one a try this week, but since I have a box full of Nilla Wafers left over from your Lemon Cheesecake Yogurt Cups, could I use those instead? How many do you think it would take to form the crust? Used the Nilla Wafers and they were perfect! Crushed them up in the food processor, used Sugar Free Blueberry Jam and added frozen blueberries while cooking. Perfection! This was so delicious! Everyone LOVED it! Thanks so much! I made this last night and it was great! My boyfriend isn't a big fan of strawberry (which is a shame)but he loves the key lime cheesecake at the cheesecake factory. I substituted lime juice for lemon juice and then added the zest of about three key limes and the juice from two of them. He thought the lime flavor could have been even more intense so I would probably add a bit more zest and lime juice in the future. It was still great though! I absolutely loved it!! I thought it was great… It did the trick for me!! 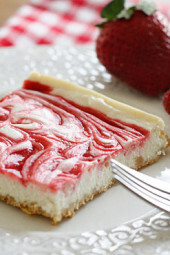 Just made this recipe b/c I was having a serious cheesecake craving! I substituted Splenda for the sugar, omitted the lemon juice (b/c no one in my house cares for it in cheesecake) and added 1/2 tsp. almond extract. It turned out great…nice and creamy and with the the preserves, just the right amount of sweetness. If I was going to omit the preserves, though, I would add extra Splenda. Also, next time I will probably blind bake the crust to get it a little crisper since it bakes less time with Splenda. Also, make sure to eat at room temperature for the best texture! THIS RECIPE WAS AMAZING!!! I made it for valentine's day last night with some strawberries on the side and my boyfriend was blown away and said it was comparable to "his mom's cheesecake" which is a huge deal. I told him it was skinny which wow-ed him even more. It was also really easy to make. The store was out of SF strawberry so I did it with raspberry and it was just as delicious!! This cheesecake recipe is pretty good. The only thing I'd change for next time is cutting back the lemon juice to 1 TBSP instead of 2. It was a little too tart than I'm used to in cheesecake, but the texture was perfect! Wonderful cheesecake recipe!! I used a premade low fat graham crust (had one that needed used). Instead of greek yogurt, I used Weight Watchers vanilla yogurt. So good. I will definitely be making this again and again. Thanks!! I made these tonight and wow! Everyone loved them and they went so fast! I doubled the reciepe and made it in an 8 x11 pan and used grape sugar free jelly. The only problem I had was that the graham cracker crust was a little crumbly but I don't know why. Maybe more butter? But thanks for this! They are great and I love your site. I put the ingredients into the Weight Watchers Recipe Builder and the points only went up to 5 (from 4). DELISH! So happy I gave this a try tonight. I didn't have any lemon juice, so I used orange, and used one egg instead of two egg whites (I only had one egg left, thanks fiance). These came out great. I second one a previous poster said about having difficulty getting the crumbs to cover the whole bottom of the pan. It barely did, but I made it work. Excited to try this with other jams! I just made these tonight and all I can say is WOW! Thank you , thank you, thank you!!! So yummy and satisfying…what a great diet friendly late night snack. Looking forward to trying more of your dessert recipes. Use plain and add vanilla extract. First of all…wow. This was awesome. Second, can you please tell me which brand of jam to use? I used SF Smucker's and after I stirred it, it kind of fell into the batter before I could swirl. Not a huge deal as it still tasted and looked great, but I need some tips. My husband hates yogurt and had two pieces! 🙂 Try this everyone – you will LOVE it. Oh and spreadable land of lakes light worked really well for the butter – it's soft already. I made this as well and loved it but my ended up cracking a lot as well. Any experienced bakers out there know a solution? One cheesecake recipe I read said to allow the cheesecake to cool for 1/2 hr in the oven to avoid cracking. Any input would be great. Ours tasted great but didn't look nearly as pretty as Gina's. I wish I were a better baker!! Perfect cheesecakes are crack-free. You can achieve this by using a spring form pan, baking cheesecake in a water bath, and baking it slow. A spring form pan allows you to easily remove the sides of the pan, no unmolding necessary. A water bath helps ensure even baking and less chance of cracks. Baking a cheesecake slowly and at a consistent temperature will make a much creamier and uniform cheesecake. First time making a cheesecake & it was amazing! I thought I'd chime in and say that I made this totally egg-less. Instead of the egg whites, I put in 1 tbsp of water, 1 tbsp of canola oil, and .5 tbsp of baking powder, mixed before adding to mixture. I live at 9000 ft., so if you don't double the baking powder. It turned out wonderful! I made this tonight but I only added 1 tbsp of lemon juice because my husband and daughter(7) said it was too tart the first time. It was very good. I made these with sugar free raspberry jam and they were excellent. Thanks Gina! I just made this today, with a fresh strawberry sauce instead of jam. SO GOOD! This recipe was AWESOME!!!!!!! Thanks!! This looks amazing. I love cheesecake and strawberries, however I'll have to make it with raspberries I think, as my boyfriend does not like strawberries at all. I think I will make it for July 4th. I bought that plate at Home Goods! Hi Gina! I am dying to make this, and I'm also dying over your white plate in the picture… where are they from?? I just made this and it is delicious! I used neufchâtel cheese as my grocery store only had full fat cream cheese. I just made these for a family dinner and they were a huge hit! Delicious! This one is a little too good for those of us who have trouble with portion control. I ate almost the entire cake in 24 hours! So I won't be making this again unless I am bringing it to a gathering. I had some of your low fat chocolate chip cookies sitting around, so I crushed them up and used them as the crust, which was quite decadent tasting. I also subbed coconut palm sugar and fat free fruit juice sweetened vanilla yogurt. So incredibly delicious. This one is dangerous for me. I'm so happy everyone is enjoying this! Nina, I wish I had an answer for you, I'm not quite sure. The only thing I did differently was use greek yogurt with honey (only because my hubby bought the wrong kind by mistake) and fat free cream cheese. I have used several recipes from this website and they have all turned out to be delish and have become favorites! Gina, my cheesecake is cooling right now! I'm so excited to serve this tomorrow for Easter. One question, soon after I removed the dish from the oven, the cheesecake cracked a LOT. What did I do wrong? I'll be covering it with fresh strawberries anyway, but any thoughts so I avoid this in the future? Thanks for all you do! Love your site and am hoping you make a smart phone app. I made these a few weeks ago with some locally made reduced-sugar Sand Plum Jelly. The only thing I did wrong was not get the butter soft enough so the crust was crumbly. After I posted the pictures on Facebook my family requested them for Easter but my mom wants lemony. I think I will try to top them with lemon curd or something lemony.